In Canada, systematic efforts for controlling antibiotic resistance began in 1997 following a national Consensus Conference. The Canadian strategy produced 27 recommendations, one of which was the formation of the Canadian Committee on Antibiotic Resistance (CCAR). In addition several other organizations began working on a national or provincial basis over the ensuing years on one or more of the 3 identified core areas of the strategy. Critical evaluation of the major programs within Canada which focused on antimicrobial resistance and the identified core components has not been previously conducted. Data was collected from multiple sources to determine the components of four major AMR programs that were considered national based on their scope or in the delivery of their mandates. Assessment of program components was adapted from the report from the International Forum on Antibiotic Resistance colloquium. Most of the programs used similar tools but only the Do Bugs Need Drugs Program (DBND) had components directed towards day cares and schools. Surveillance programs for antimicrobial resistant pathogens have limitations and/or significant sources of bias. Overall, there has been a 25.3% decrease in oral antimicrobial prescriptions in Canada since 1995, mainly due to decreases in β lactams, sulphonamides and tetracyclines in temporal association with multiple programs with the most comprehensive and sustained national programs being CCAR and DBND. Although there has been a substantial decrease in oral antimicrobial prescriptions in Canada since 1995, there remains a lack of leadership and co-ordination of antimicrobial resistance activities. Antimicrobial resistance (AMR) has dramatically increased since the 1990s, and it is widely acknowledged to be a global public health threat [1–4]. In Canada, systematic efforts for controlling antibiotic resistance began in 1997 following a national Consensus Conference held in Montreal entitled "Controlling Antimicrobial Resistance: An Integrated Action Plan for Canadians" . The conference, co-sponsored by Health Canada and the Canadian Infectious Disease Society, developed a plan which emphasized 3 core areas: antimicrobial stewardship, surveillance to monitor resistance trends and infection prevention and control (IPC). The Canadian strategy produced 27 recommendations, one of which was the formation of the Canadian Committee on Antibiotic Resistance (CCAR), a multidisciplinary committee which performed a collating and coordinating role for stakeholder groups across Canada. In addition several other organizations began working on a national or provincial basis over the ensuing years on one or more of the 3 identified core areas formulated during the Consensus Conference. Critical evaluation of the major programs within Canada focused on antimicrobial resistance and the identified core components has not been previously conducted. This paper describes the identification of major AMR programs in Canada between 1995 and 2010 and critically examined the components of surveillance and stewardship. A summary of the components of four major AMR programs that were profiled are provided in Table 1. Although the DBND Program was initially provincial in scope, it was included in the evaluation since other provinces began using the program or portions of the program. Three of the programs had governmental funding and one was funded by a pharmaceutical company and had a very short duration. Most of the programs used similar tools but only the DBND Program had components directed towards day cares and schools. Only the CCAR Program distributed "toolkits" to all Canadian physicians. The DBND program had the most rigorous evaluation of its activities. The sources of antimicrobial resistance surveillance, their funding source and sources of bias are illustrated in Table 2. Unfortunately all the surveillance programs have limitations and/or significant sources of bias. Although the CIPARS surveillance is the most comprehensive, it is not population based and focuses on pathogens associated with food-borne illnesses . 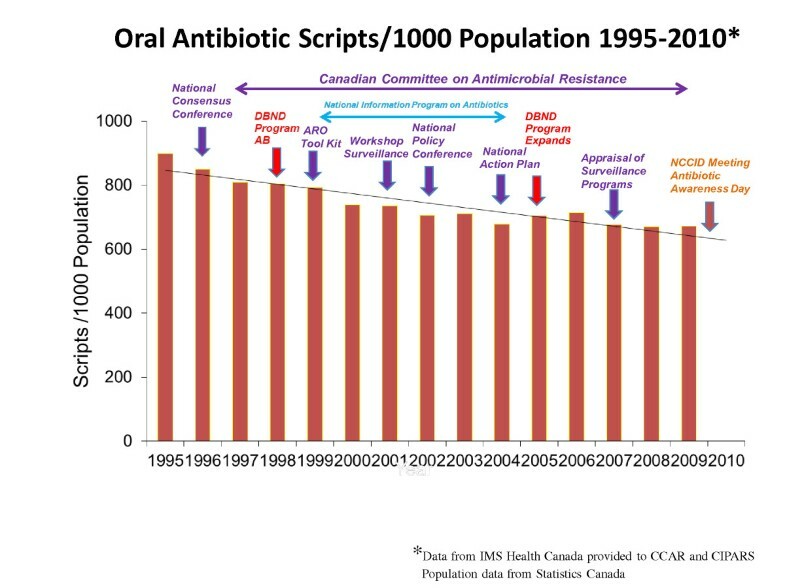 The surveillance results of total oral antimicrobial scripts in Canada, adjusted by population and their temporal relationship to AMR Programs between 1995-2010 and the breakdown of scripts by class are illustrated in Figures 1 and 2. Most of the programs used similar tools but only the DBND Program had components directed towards day cares and schools. Most of the programs used similar tools but only the DBND Program had components directed towards day cares and schools. There appears to be a corresponding increase in the use of quinolones and macrolides, much of this driven by increases in newer generation agents in each of the two categories . Oral antimicrobial scripts in Canada and temporal relationship to AMR Programs. 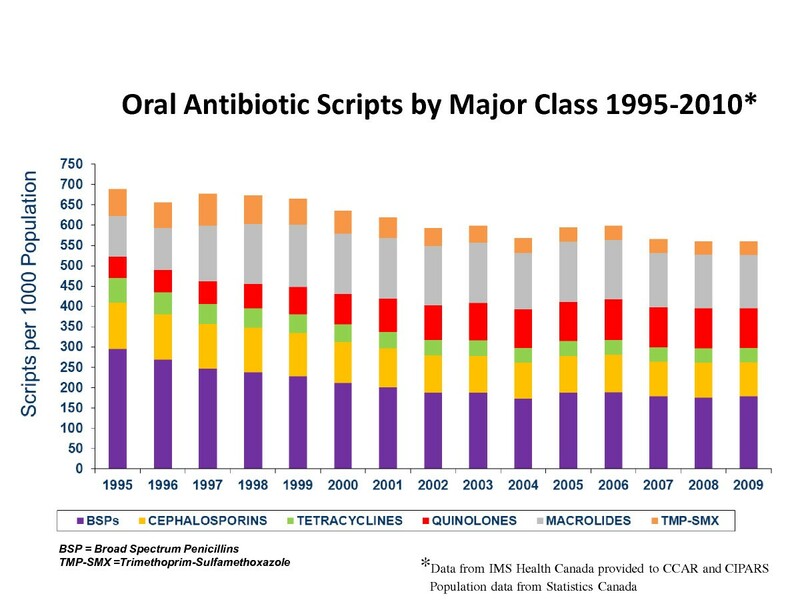 Oral antimicrobial prescribing by major class in Canada 1995-2010. Although the findings from this report focus on only a few nationally focused efforts that took place over the last 15 years, a number of additional provincial, regional and local efforts were also undertaken across Canada [11–14]. Most of the efforts focused on communications to physicians, pharmacists and the general public. Overall, there has been a 25.3% decrease in oral antimicrobial prescribing in Canada since 1995, mainly due to decreases in β lactams, sulphonamides and tetracyclines, in temporal association with multiple programs with the most comprehensive and sustained national programs being CCAR and DBND. It is acknowledged that this is only an association and may be a spurious finding but the consistent and sustained observations over 15 years provide arguments that the AMR programs have had an impact . The findings also demonstrate that there is no population based surveillance of common community pathogens such as Streptococcus pneumoniae or Staphlyococcus aureus where resistance is common. Reliance on Pharma funded surveillance is not comprehensive and has significant difficulties with sampling bias . There is a need for a federally funded population based surveillance of common community pathogens rather than reliance on Pharma funded surveillance. Although the CIPARS Program offers a comprehensive and co-ordinated approach to some AMR activities, it is a limited focus. Currently, from the human perspective, there is a distinct lack of leadership and co-ordination of AMR activities at the national level in Canada and concerns may be raised about losing some of the gains that have been made over the years. JC has received honoraria from the Canadian Agency for Drugs and Technologies in Health for work as an expert reviewer and clinical expert, respectively, for projects on the role of rapid polymerase chain reaction (PCR) testing for methicillin-resistant Staphylococcus aureus in hospitalized patients and the use of vancomycin or metronidazole for treatment of Clostridium difficile colitis. He has also received speaker's honoraria related to new antibacterial agents from Janssen-Ortho, Pfizer, and Astellas Pharma during the past five years. JC was involved in the conception and design of this study, collation of data, the interpretation of the data; drafting the manuscript and revising it critically for important intellectual content; and provided final approval of the version to be published.